Every few months I seem to go on a massive reading binge that is often the result of getting a bunch of books I have placed on hold at the library. I am so blessed to live about two blocks from the Main branch here in Ottawa and I'd just like to take a second to say that the Ottawa Public Library rocks. You can go online, find the book you want and place a hold on it. It is then sent to the branch of your choosing. You get an email when it's ready for pick up and all you have to do is drop in and check it out. Bonus is that the Main branch has self serve checkout so it takes two second to pick up your book(s). Libraries are great resources and they are free to use. I do buy some books but I probably save myself hundreds of dollars each year by using the library. Anyways, back to my post. 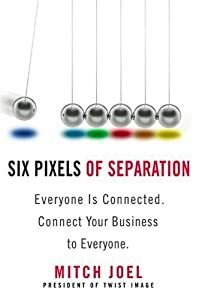 I recently finished reading Mitch Joel's book "Six Pixels of Separation". It is a must-read for anyone looking to understand how the web has enabled us to be connected and includes lots of great actionable content that you can start applying right away. One thing that is in the book that blew me away (and still is blowing me away days later) is the fact that bad reviews convert better than good ones. Everyone I mention this to can't really believe it but when you listen to the reasoning and methodology, you see that it does make sense. What is almost more interesting to me is the sense that marketers have been conditioned (and I don't know why or how this happened) to feel as though we need to shield our customers from negative reviews. If you've ever wondered whether or not you should use data to make decisions (and test whenever possible) - there it is. I'd like to run some test on a product page sometime. I also have a few books waiting to be read as well. One of them is Marty Neumeier's "The Brand Gap". Which is, obviously, all about branding. I have heard so many good things about this book and I started it just last night. The other one is Sally Hogshead's "Fascinate" which is a book I have been waiting about six months to get. I have heard interviews with Sally on podcasts so I have a pretty good idea of what the book is all about but I'm still looking forward to reading it. Fascinate is all about teaching marketers 7 triggers for creating products and marketing messages that appeal to your audience. The last one I have to pick up this afternoon, is Greg Verdino's "Micromarketing" which is all about social media marketing but more specifically, using small bits of content spread all over the place, in a unified manner, to get your message across. I've got my work cut out for me in the next few weeks as these books are all due back by the end of the month. Better get to it!